Greg and I got an early start. We didn’t see Phyllis or Manfred when we left right after breakfast. We did run into Manfred however about halfway to San Martin and said hello. It appeared that he wanted to walk alone and we left him there. In a couple of hours we arrived in Hospital de Orbigo. By now the sun had come out and it was a beautiful day. At the famous Puente we ran into an American couple who had just joined the Camino in Leon. The woman asked me to take their picture overlooking the bridge, which I did. Then she looked at the picture I took and asked me if I would take another, but this time without my thumb in the picture. It was a pretty snotty remark, the way she said it, and Greg and I would laugh at this from time to time. As we crossed in the main part of town, we could see the jousting field on our left. It looked as if they were preparing the field for an event to come later in the month. 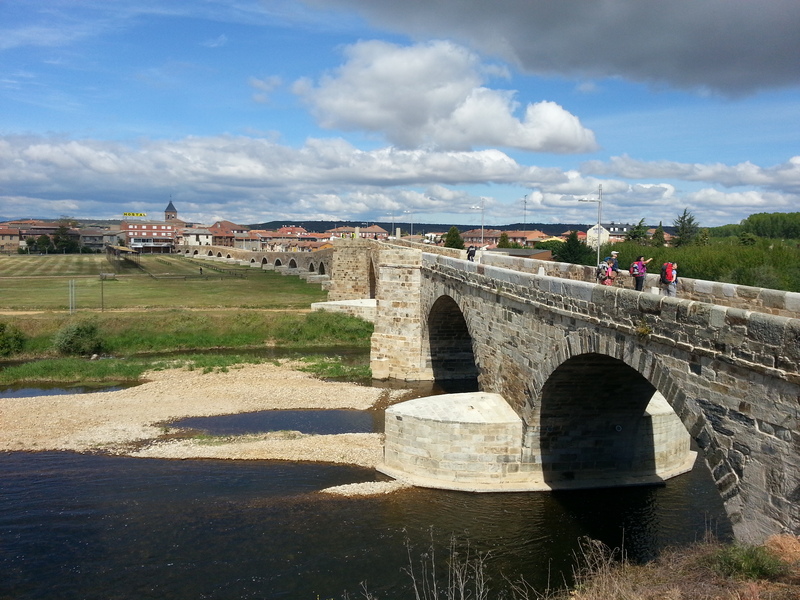 On the other side of the bridge, we stopped at a small park right on the Camino in the center of town and ate lunch. Just as we were wrapping up lunch, Phyllis came strolling by. She joined us and walked with us for a while. 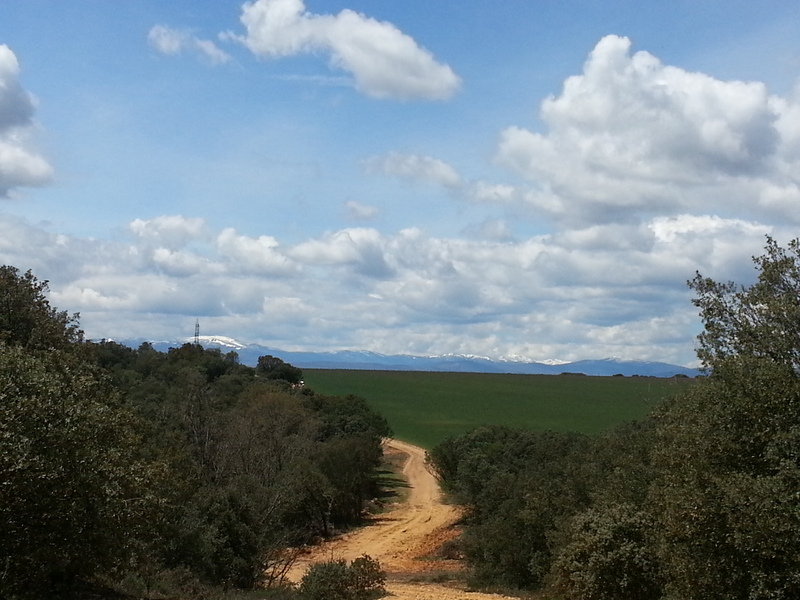 Outside of town we quickly entered a farming area where there were crops surrounding us. Ahead of me I noticed a young woman really struggling to get along. Greg thought her pack was too heavy for her. Indeed it was, and I noticed that she was really limping badly. I went over to her and asked if she needed help. She said that she would be alright. We wished her a good day and blessed her for safe travel from this point. Before long we got to Santibanez de Valdeiglesia. Phyllis left us at this point and stopped at a bar to eat and rest. We kept going and began soon to climb up some very steep hills towards Alto Santo Torbio. On the way up and at a flat point of the trail, we happened upon a guy riding a unicycle. Was he kidding? 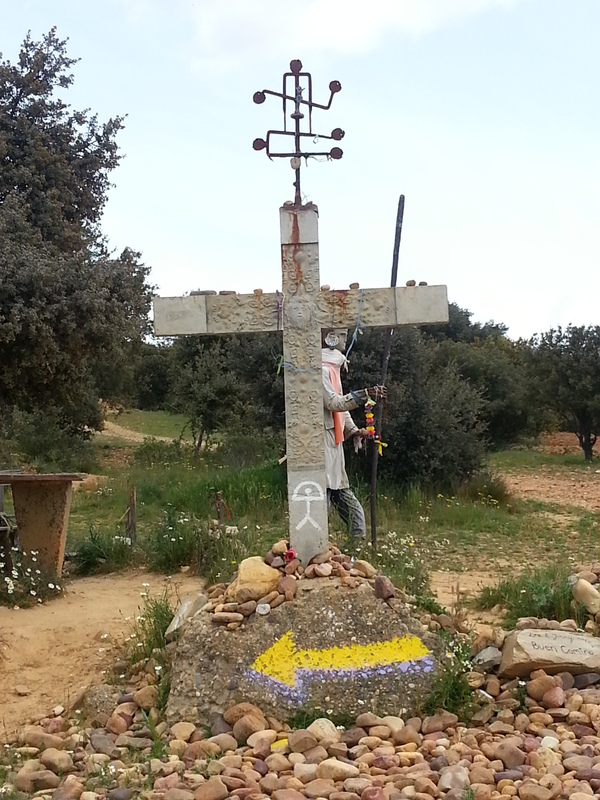 It became apparent that there were more pilgrims on the trail now since many had started in Leon and were now joining us after Orbigo where the two routes came together. The sun was beating down now and we were sweating getting up the mountain to the Alto. At the top, we happened upon a small cantina run by an interesting guy who lived there. He had fruit and water and other snacks spread out and they were all free for the taking, but most pilgrims were leaving donations. The water was fresh and cool. Greg took a glass, but I did not. 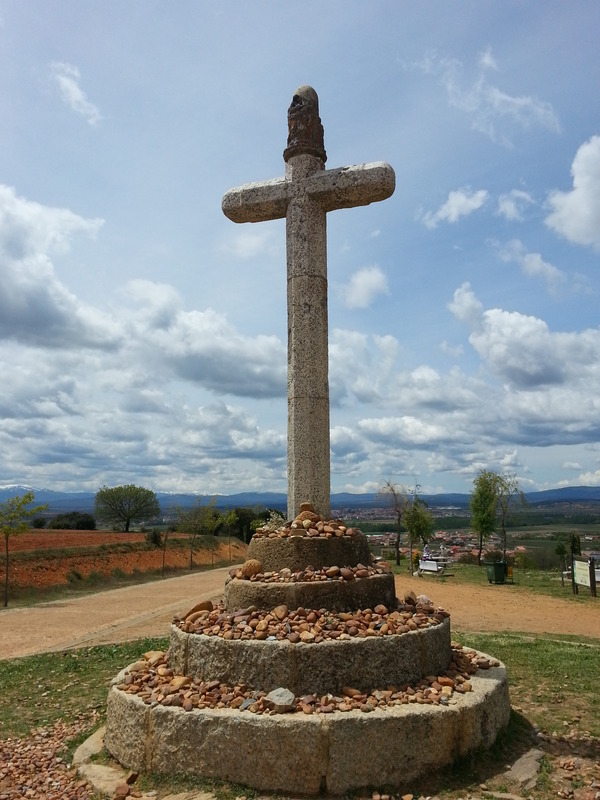 We kept on moving to the Cruceiro de Santo Toribio which overlooked the town of Astorga about 5k away. At a picnic area near the Cross, we saw the American couple once again who waved to us. I told Greg I was going to take some pics of the Cross and he told me to make sure I kept my finger out of the picture. 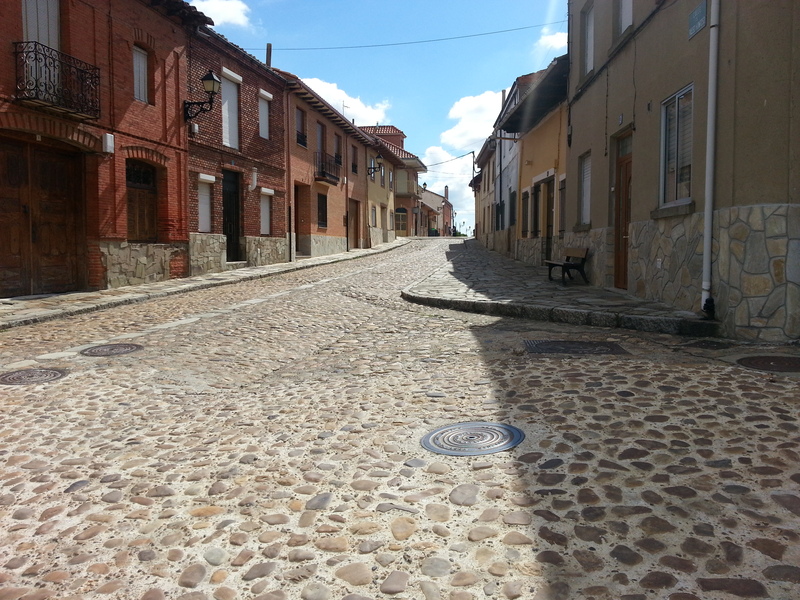 The walk down to San Justo was on pavement and hard on the toes, but I was glad to be going down. 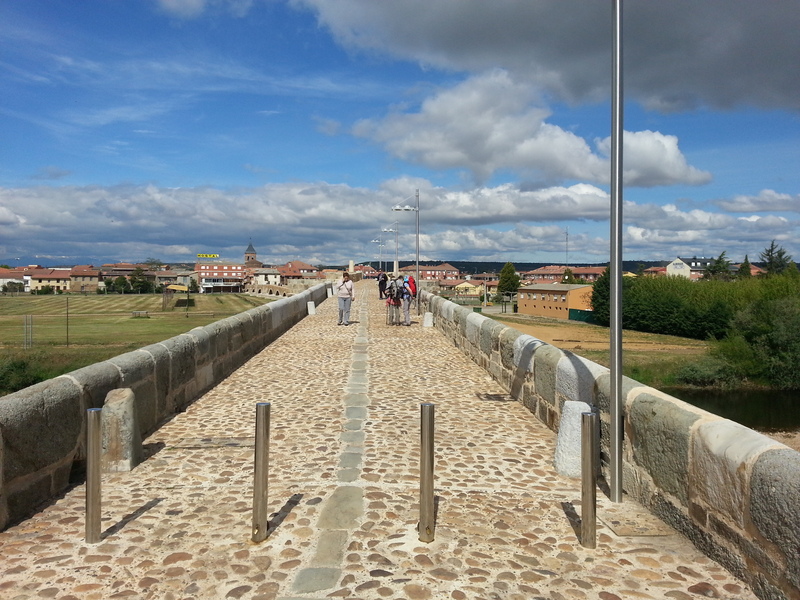 Before long we crossed the rio Tuerto and headed towards the outskirts of Astorga. When we got to the RR tracks, the only way over was on this strange winding green iron structure that made us laugh uncontrollably. After that it was into the city and a steep climb up a cobblestone street, thrugh the Puerta Sol and into Plaza San Francisco. 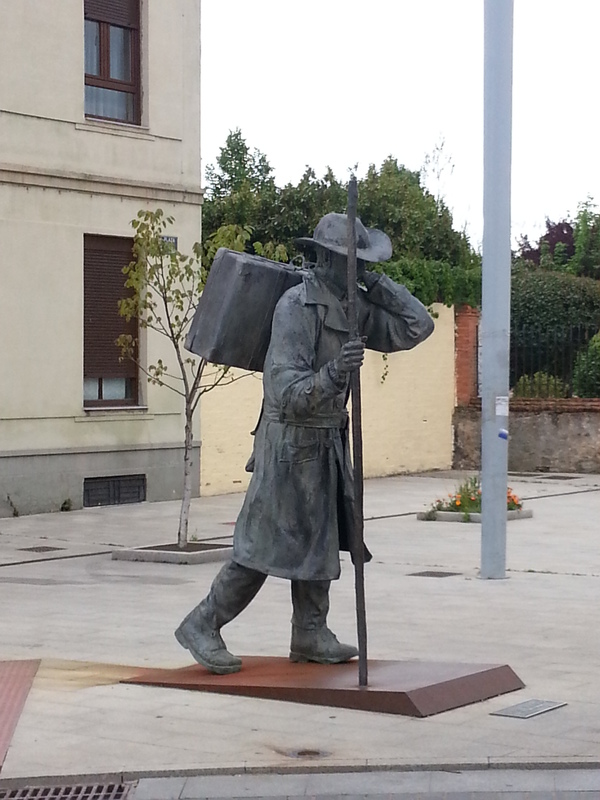 There was a statue of a traveler that greeted us there along with some locals outside a bar who welcomed us. We continued on through three plazas, enjoying the ambiance of the city, until we finally got to Plaza Catedral at the north end of town where our hotel was located. We entered into the lobby area and there was the American couple who were waiting at the desk. The woman stated: “I hope you have a reservation, because the hotel is full!” I replied that we did, and she gave me a major humph. We never saw them again. Hotel Gaudi was a beautiful place. We found our room after locating our bags in the lobby, and took an elevator to the third floor. The room was spacious and we had plenty of room to spread out our stuff. 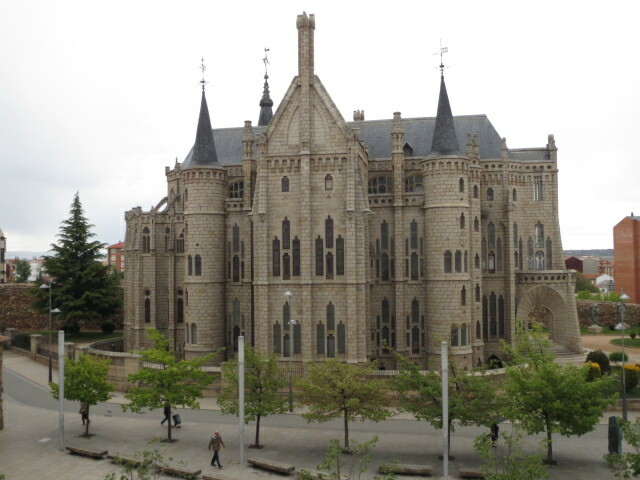 I opened the drapes and there across the street was the beautiful Palacio Episcopal by Gaudi. What a view! Greg was first in the shower. When he came out, he got dressed and headed out to find a market and get some food for tomorrow. I took my shower, got dressed and went down to the bar for a beer and to email and Facebook. While I was there, Phyllis, Pia, and Manfred came in and joined me. They were staying at another hotel, but knew that we were at the Gaudi and set out to find us. Manfred wanted a list of all the hotels we were staying in so he could book them up ahead of time. I went back to the room and found my vouchers Soon Greg returned from shopping. We all sat in the bar for an hour or so until the dining room opened up. After getting set up at a table, we found the waiters to be terrific and very accommodating. Before long, the two Germans came in and got a separate table. They waved to us and were happy to see us. Dinner was really delicious and the conversation was even better. Our topics ranged from all the cultural differences in our respective countries to politics to religion. Pia shared that she was a unionist, belonging to the teacher’s union in Switzerland. She simply could not understand what I was talking about when I explained the issues we had in California with public unions – the power they wielded and the control they exerted over the legislature. It was just something unknown to her and quite mystifying. Manfred told us that in Germany, the government had reached an agreement with the unions to lower their wages so they could make the whole relationship work and improve the economy. Greg and I chuckled over this – thinking about how far America was from even thinking about this concept. After dessert and some aperitifs, we all said goodnight. When we got back to the room after dinner, I noticed that Greg had purchased a new shell for my backpack to replace the one I had lost several days ago. I was very touched by this and thanked him. He had also bought some fruit for the next day’s sojourn.